They’re simultaneously simple and sublime. Not exactly a cake nor a cookie, a doughnut nor a pancake. But a little disk of fried rice flour with a hint of sea salt, that’s all. 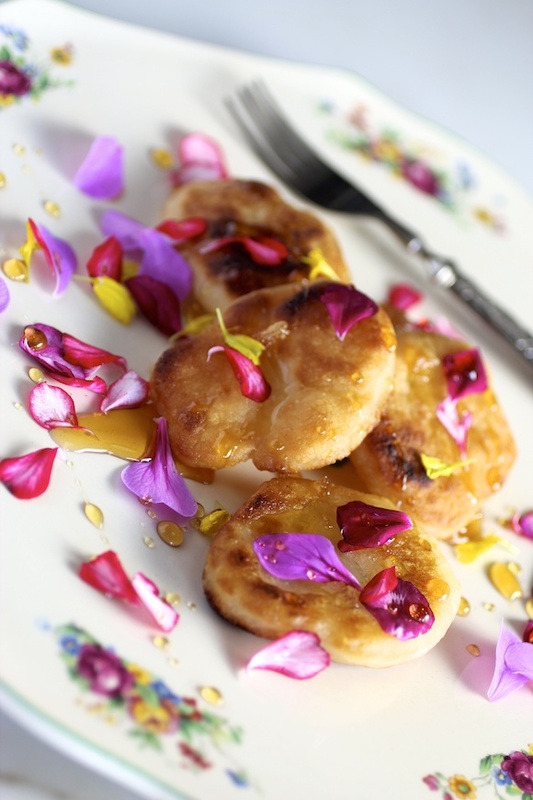 Sprinkled with edible flower petals and drizzled with orange blossom honey. Served with rose petal tea. 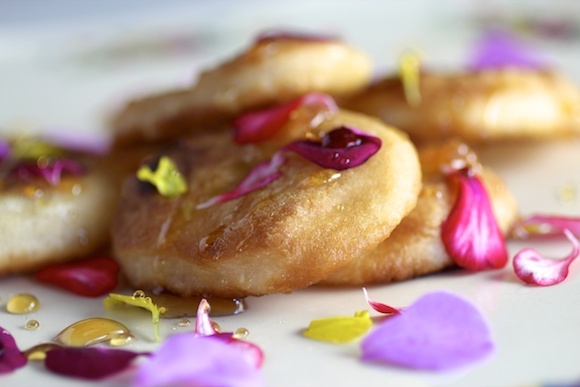 With Spring right around the corner, this delightful Korean sweet treat called hwa jeon is certain to charm your guests. This dessert is naturally gluten-free. It is made from glutinous rice flour also known as sweet or sticky rice flour. “Glutinous” refers to the type of rice, not gluten. Makes about 10 hwa jeon. In a mixing bowl, sift flour and salt together. Add water and mix well. Knead dough for 10 minutes. Form dough into disks. Heat oil over medium-low heat. When oil is hot, add dough and cook until puffed and golden, then flip and cook the other side. Drain on paper towels. Place rice cakes on a pretty platter. 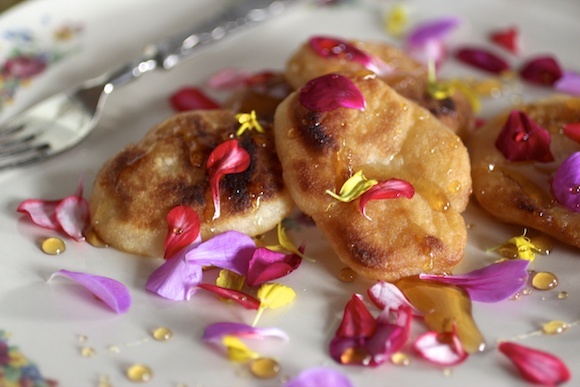 Sprinkle with flower petals then drizzle with honey. As always, choose blossoms that are certain to be edible, grown without pesticides or chemicals, and only eat flowers in moderation. People with respiratory allergies and asthma may need to refrain from eating flowers. For my hwa jeon I use scented geranium and signet marigold from my garden. 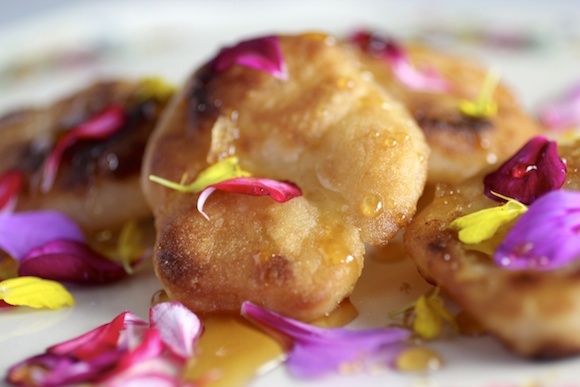 Geraniums are an especially good flower to pair with desserts due to their mild fruity flavors. Yellow marigold petals add a lemony note. Rinse petals in a bowl of cool water, gently swooshing to remove any dirt. Spread out to dry on kitchen towels. Warning: I have seen several recipes for hwa jeon online and in cookbooks that call for azalea flowers, but I have also read that azaleas are toxic. Wild azaleas growing in the mountains of Korea may be different than the variety grown in the US. 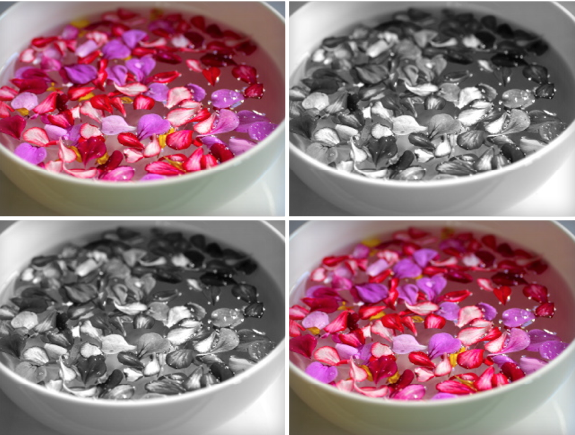 Simmer rose petals in water for about 5 minutes. Strain and serve. This recipe was inspired by Korean Cooking by Young Jin Song. 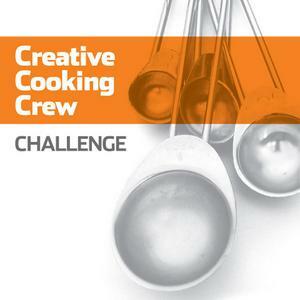 The Creative Cooking Crew is a group of innovative food bloggers hosted by Laz of Lazaro Cooks! and Joan of FOODalogue. Each month brings a new culinary challenge with a round-up of all the entries posted at the end of the month. Although there is no real judging and the challenges are all just for fun, we take pride in sharing our entries, pushing our culinary limits. February’s’s Challenge is RICE to which I am bringing my HWA JEON. Laz is showcasing all the rice dishes in the round-up on his blog here. Brilliant! Kudos for the challenge and the presentation! 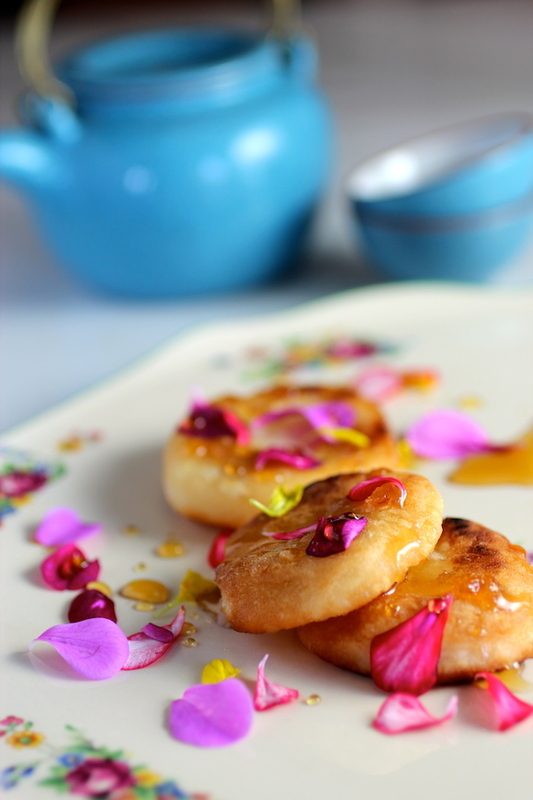 These little tea cakes are beautiful and so delicate looking. What a lovely presentation! Yikes, these are so beautiful. 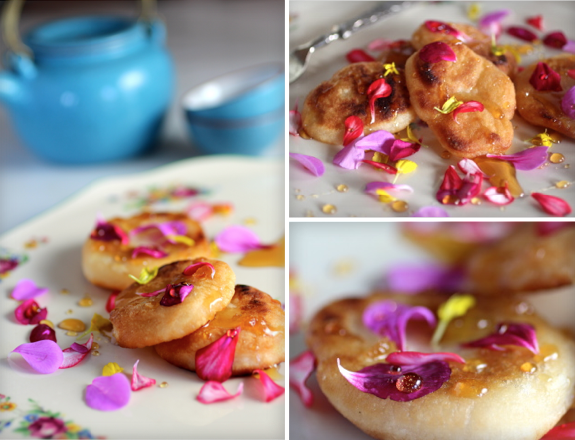 I made rice pancakes that were all the rage 100 years ago and I loved them. These look too beautiful to eat… almost. What magnificent shots too… such a great job and I’ve never heard of these before. I can’t believe you have flowers… it’s 20º here today!!! I can almost taste the sweetness of it just by looking at it! 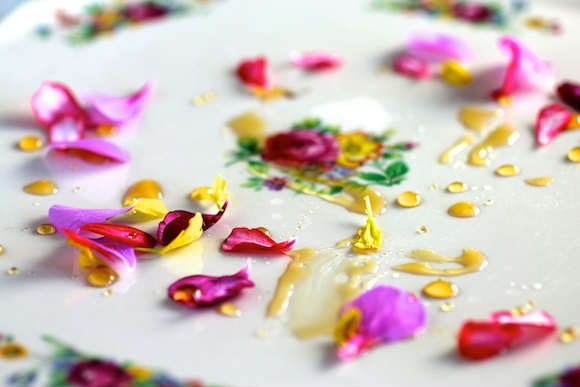 I love the use of the flower petals to create a stunning dish! I thought about using rice flour as a play on rice for this challenge and I’m so happy to see someone did that! These look so yummy and the presentation is so pretty. Well done 🙂 Pinned it! Very creative choice for this challenge, will have to give this a try. Great plating and love the edible flower petals. absolutely gorgeous! I would love to sit down with these and a cup of tea! I like how the flower petals prettied up a simple cake. Very pretty. I’ve never had these before (this is where my lack of sweet tooth comes in) but I am tempted by how these are fried. How I love this exquisitely simple kind of cooking. A true work of art! Your post is truly a feast for the eyes…just beautiful.